President Potter: Necessary Fact Checks! On April 20, 2015, President Earl Potter sat for an interview with Jim Maurice on AM 1240 WJON. 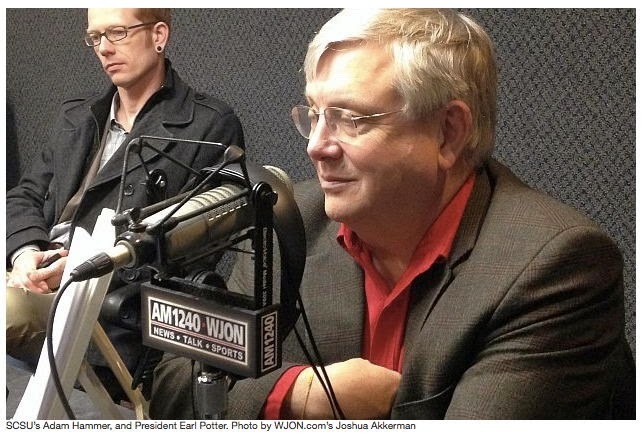 According to the article President Potter makes a number of statements that need to be fact checked. According to the website of the Office of Strategy, Planning and Effectiveness the following enrollment plot is shown. The plot clearly shows a decline in FY11, FY12, FY13 and FY14. On February 16, 2015, Associate Vice President and Associate Provost Lisa H. Foss sent an email entitled: “FYE enrollment projections information.” A table from the email is reproduced below. FY 15 is not yet through but the table shows that enrollment will be down 5.0%. So if enrollment was down in FY11, FY12, FY13, FY14 and FY15, isn’t this a five-year enrollment decline? So what “three-year decline” is President Potter referring to when he hopes for a reversal in SCSU’s prospects? 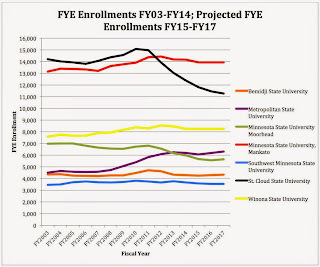 In the five-year period since FY10, FYE enrollment at SCSU has declined by 21.8% and according to his data analytics group, enrollment is predicted to decline for another 6 years. If his group is right SCSU is at least 6 years away from possibly turning the corner on enrollment decline. Let’s check the second part of the statement first (that “they’ll need to make another $10 million in cuts next year.”) A portion of the Meeting Notes of the Portfolio Management & Resource Allocation Steering Group meeting of April 8, 2015 is reproduced below. This document clearly states that the FY16 cuts are going to be $12 million. I guess while President Potter was on his three-week international excursion he wasn’t keeping up with the activities on campus as well as he thought he would. Or perhaps he has new information that the cuts will only be $10 million. If this is indeed the case, he probably would have stated that he originally thought he needed to cut $12 million but found out that he only needed to cut $10 million. Unfortunately, it is more likely that the cut really needs to be $12 million and he either misspoke or is ‘out of the loop’. Let’s hope it’s the former and not the latter. On Thursday, April 23, 2015, Vice President for Finance and Administration Tammy McGee provided documents at the Budget Advisory Group meeting that list the projected deficit for FY16 as $12,268,000. Now the first part of the statement also needs to be checked (“Potter says they’ve trimmed the budget by $4 million this year).” According to budget documents released on Thursday, April 23, 2015, by Vice President for Finance and Administration Tammy McGee at the Budget Advisory Group meeting, SCSU has not actually cut $4 million but rather only $2,827,000. As a result, $1,173,000 still needs to be cut to get to the $4 million target and that will still mean SCSU will have spend $5.5 million more than it takes in revenue this year. I’m not going to challenge the enrollment across the country part of this statement but the following Figure shows MnSCU data for FYE enrollments from FY2003 through FY2014 (the actual final numbers), plus as of last fall each university’s own predictions for enrollment for FY2015, FY2016 and FY2017. Only two universities in the MnSCU system could be labeled as being “in decline” and they are Minnesota State University—Moorhead and SCSU. From FY10 to the prediction for FY17, Moorhead’s decline of 1,072 FYE represents a decline of 15.9%. For the same time period, SCSU’s decline of 3,871 FYE represents a decline of 25.3%! 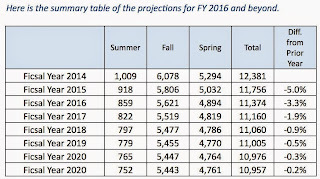 It is also interesting to note that Moorhead actually predicts an enrollment ‘bottom’ for FY16 followed in FY17 by an increase of 96 FYE. 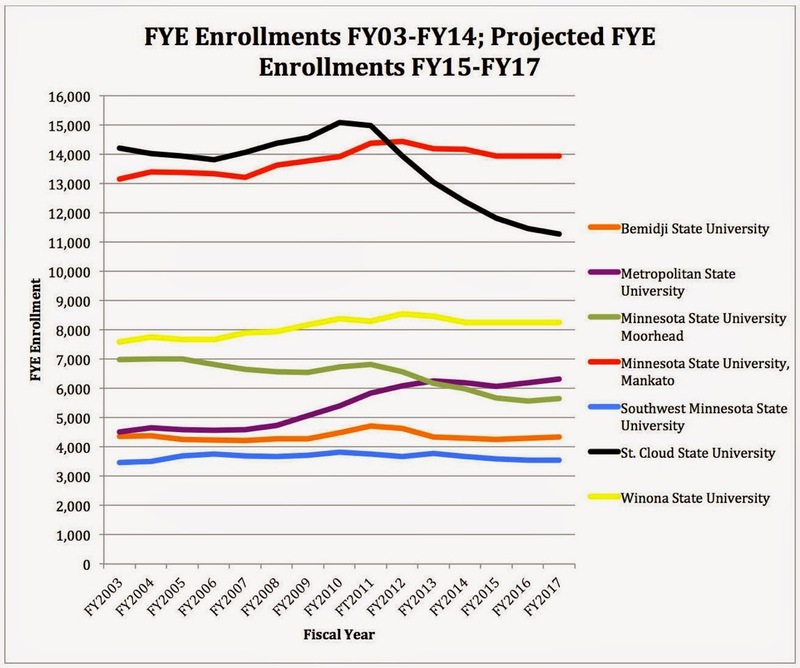 On the other hand, SCSU’s prediction for FY17 continues the enrollment slide from FY16 losing an additional 195 FYE. President Potter cites that new student admissions and new entering transfers are up for next fall. Additionally, he cites that “our returning students are up as well.” Unfortunately, his highly praised Data Analytics Workgroup on February 15, 2015 predicted FY16 enrollment would be down 3.3%. As a result, even if the new student admissions and transfer admissions are up, the prediction is that the enrollment will still be down. Decreasing the enrollment decline from 5.0% to 3.3% is a good thing. However, it is important to recognize that the enrollment is still declining. A 3.3% decline is going to lead to a loss in tuition revenue and ultimately the enrollment loss will lead to a lower state appropriation. So the question is exactly what ‘corner’ has been turned? The Data Analytics Workgroup projections for FY17 was a decline of 1.7%, FY18 was a decline of 0.9% FY 19 was a decline of 0.5%, FY20 was a decline of 0.3% and FY21 of 0.2%. While the rate of decline is projected to decrease, has a corner really been ‘turned’ if the enrollment is projected to decline for the next six years? 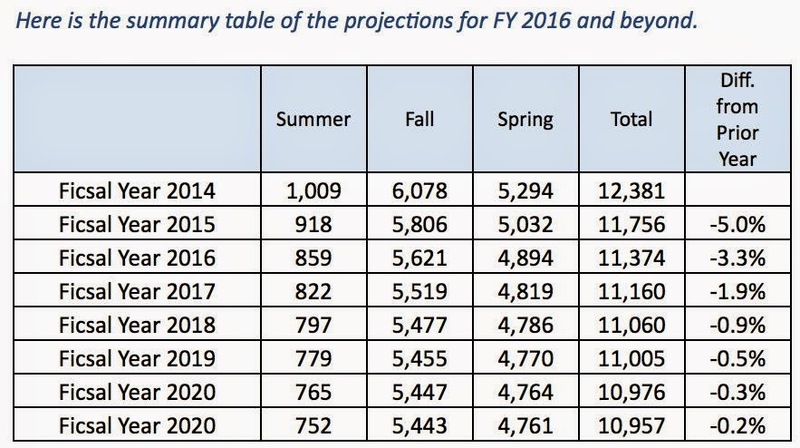 Unfortunately, even if all of the cuts are made and enrollment declines follow the projections, for FY16 SCSU will still have spent all but 1.5 million of its reserve. If SCSU has to rebuild the reserve to 10.5 million (as required by MnSCU), the budget for FY17 will have to be cut by 10.5 million, enrollment will have to grow significantly without increasing expenses in order to generate excess revenue to expenses, or a combination of the two for SCSU to be restored to fiscal health. If President Potter’s excuses: “part-time students,” “demographics,” “that shock of coming out of the recession,” and the “decline in the number of high-school graduates” have any basis in fact, it is hard to believe that SCSU will be able to “turn the corner.” More likely, we’ll just hear another excuse and more misstatement of fact. Only off by 2 years and $2 million. It’s pretty obvious that math is not one of Potter’s strong suits.